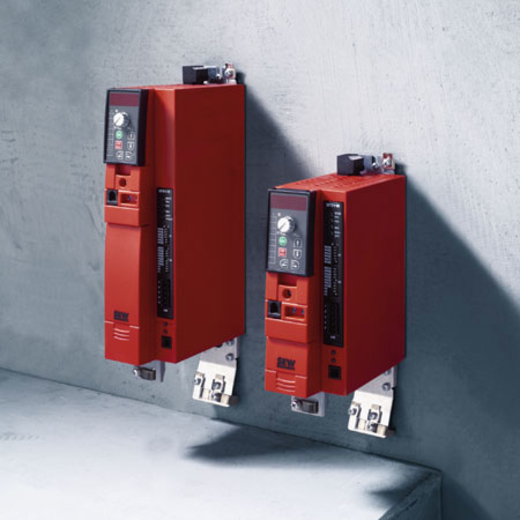 From fan applications to material handling technology up to simple positioning functions: Movitrac® B series frequency inverters solve many tasks in an easy and economic manner. Device modularity and reduced size are the most important selection criteria when purchasing a frequency inverter for standard applications. Frequency inverters of the Movitrac® B series not only meet the major technical data, they are also economically in terms of purchase and operation, and have proven reliable in practice for years. Designed, developed, and made by SEW-Eurodrive makes this inverter series perfectly matched to the motors of the DR.. series. They control the speed of the new DR...J synchronous motors (LSPM technology) just like that of asynchronous motors or explosion-proof EDR..x motors. The series is completed by a modular concept of options and accessories. This is why the frequency inverters of the Movitrac® B series are suited for a wide range of industries and applications.